Lord Vishnu, the Inconceivable Ultimate, is the Supreme God. He is the preserver and upholder of dharma and part of the Hindu Trinity. In Vaishnavism, he is the Supreme Self and the Lord of the universe, who manifests variously as part of His obligatory duty. Bhagwan Vishnu is usually shown with light blue skin and four arms holding a lotus, mace (gada), conch (Shankha) and disc (chakra) in each of four hands. In the Vishnu Sahasranama, he is called Paramatman or Parameshwara and is periodically reborn as an Avatar upon the earth in order to destroy evil and bring deliverance to the pious. He is also the refuge of the Devas in their battles against Asuras. He is also considered to be the first God, Adideva. He is beyond birth, death, time. He is beyond all. Along with Vishnu, other major Hindu gods like Brahma, Shiva, and Shakti often engaged in wars either in the form of Avatars or in their true form. Most of the gods are shown with weapons of various kinds. Kaumodaki is the Gada or mace weapon of Lord Vishnu. Vishnu is mostly depicted with four hands holding different weapons; Sudarsana Chakra, Panchjanya Shankh (Conch), Koumadika (Mace) and Padma (Lotus). The Kaumodaki Gada is usually depicted in the Lord’s lower right hand or lower left hand. Vishnu is known as Shankha-Chakra-Gada-Pani as he holds these weapons in his hands.The divine mace weapon Kaumodaki of Vishnu is considered invincible and without parallel. The Gada is also found in the iconography of Vishnu’s different avatars such as avatars Matsya, Kurma, Varaha, and Narasimha. Lord Krishna slew demon Dantavakra with it. The bow of Rama, 7th avatar of Vishnu is called “Kodanda”, also known as Vaishnavat. He is often referred to as Kodanda pani in ‘Keertanas of Sriramadasu’ and even Annamacharya often refers lord Rama as ‘Kodanda Pani’. It was also said, “kodandaha panayo yasya saha”; The person who holds kodanda in his hands, he is Sri Rama Chandra! Nandaka is the Sword of Vishnu. Vishnu Purana says that Nandaka, “the pure sword” represents Jnana (knowledge), which is created from Vidya (translated variously as wisdom, knowledge, science, learning, scholarship, and philosophy), its sheath is avidya (ignorance or illusion). The Varaha Purana describes it as the destroyer of ignorance. The personal missile weapon of Vishnu in his Narayana (Naraina) form, this Astra lets loose a powerful tirade of millions of deadly missiles simultaneously. The intensity of the shower increases with resistance. The only solution is total submission before the missile; only then will it cease. The Narayanastra was first used by Lord Rama in the Ramayana. Then, thousands of years later, this Astra was again used by Ashwatthama in the Kurukshetra War against the Pandava army. Parashu is the weapon of the god Shiva who gave it to Parashurama, sixth avatar of Vishnu, whose name means “Rama with the Axe”. Parashurama, a disciple of Shiva was known to have terrible temper having lost his father to the evil asura. In his anger, Parashurama used the Parashu to get rid of the all the Earth’s tyrannical kshatriya caste twenty-one times over. Parashurama’s weapon had supernatural powers. It had four cutting edges, one on each end of the blade head and one on each end of the shaft.The Parashu was known as the most lethal close combat weapons of the epics. It is also one of the weapons of Lord Shiva and Goddess Durga and is still depicted on their idols throughout India. The magical and utterly powerful Chakra, it was circular like a disc with spinning capability and had serrated and sharp edges. The Sudarshan Chakra flies at the command of Sri Krishna, spinning away to tear off the heads of his opponents, or to perform any function desired by Vishnu. According to one version, the Sudarshana chakra was made by the architect of gods, Vishvakarman. Viswakarma’s daughter Sanjana was married to Surya, the Sun God. Due to the Sun’s blazing light and heat, she was unable to go near the Sun. She complained to her father about this. Viswakarma took the Sun and made him shine less so that his daughter would be able to hug the Sun. The left over Sun “dust” was collected by Viswakarma and he made three things out of it. The first one was the famous aerial vehicle Pushpaka Vimana, the second being the Trishula (Trident) of Lord Shiva, and the third was the Sudarshana Chakra of Lord Vishnu. However, as per the Shiva Purana, the Sudarshan Chakra was gifted by Shiva to Vishnu. When Vishnu worshipped Shiva by offering 1000 lotus flowers, Shiva hid one of the flowers to test Vishnu, so to complete the offering Vishnu placed one of his own eyes. The thousandth one being one of his eyes, in a way, also accounts for the name too, Sudarshana, which literally means ‘Good Vision’. Sudarshana Chakra most famously used by Vishnu’s 8th Avatar, Sri Krishna. It also protected the great king Ambarisha who was about to be cursed by the Rishi Durvasa as Ambarisha was a great devotee of Lord Vishnu. This is the weapon used by Krishna to kill Sisupala at Yudhishthira’s Rajasuya Yagna. It was also used by Vishnu to cut Goddess Sati into 52 pieces after she gave up her life in humiliation. It is said that Shiva, in grief, carried around her lifeless body and was inconsolable. The 52 parts of the Goddess’ body were then tossed about in different parts of Bharatvarsha and came to be known as Shakti Peeths. The personal missile weapon of Krishna, once fired it cannot be thwarted by any means, save by the will of Vishnu himself. This Astra was used by King Bhagadatta, son of Narakasura and King of Prajyogsta (modern day Burma) in the Mahabharata war against Arjuna. 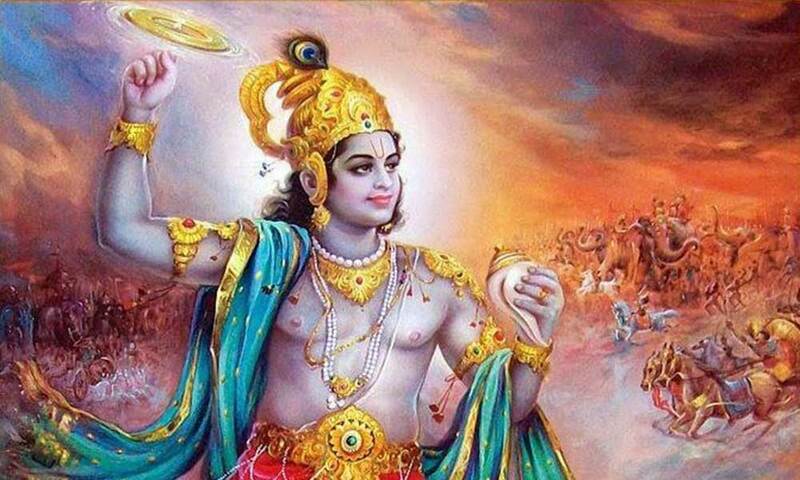 This Astra was stopped by Shri Krishna himself, as Arjun couldn’t stop it even with his most powerful weapons. Buddhi literally means the mind or its intelligence or consciousness or wisdom, which is superior to any other materialistic weapon. Without a doubt, the person who possessed it most and used it weapon most in the war of Mahabharata was Sri Krishna. The Vaishnavastra was only known to Lord Krishna, Narakasura, Bhagadatta, Pradyumna and Parashurama during the Mahabharata age and only to Lord Rama and Indrajit in the Ramayana age. The working senses are superior to dull matter; the mind is higher than the senses; intelligence is still higher than the mind, and he [the soul] is even higher than the intelligence. Thus knowing oneself to be transcendental to the material senses, mind and intelligence, O mighty-armed Arjuna, one should steady the mind by deliberate spiritual intelligence and thus — by spiritual strength — conquer this insatiable enemy known as lust. So powerful is the wisdom of mind that Sri Krishna almost single handily won the great war even without lifting a single weapon.